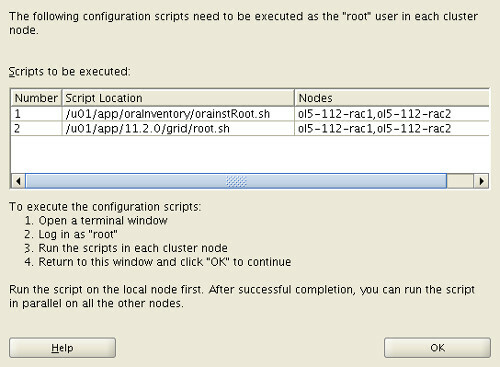 In this blog I will talk about how to cleanup a failed installation of the Oracle Clusterware 11gR2 in one particular node. I was installing the new Oracle Clusterware 11.2.0.1 in my home lab by follwing Tom Kyte's instructions (http://www.oracle-base.com/articles/11g/oracle-db-11gr2-rac-installation-on-oel5-using-virtualbox.php#install_grid_infrastructure), then went through the part that the installer GUI needs us to run the root.sh scripts. The script run successful in the RAC1 node but in the RAC2 node. So when the script finished in RAC1 tried to run it again in RAC2, but the same results "the output was that the script was already ran". What to do next?, do I have to start over from scratch? Surfing the web found a good & useful article from Guenadi Jilevski (http://gjilevski.com/2010/08/12/how-to-clean-up-after-a-failed-11g-crs-install-what-is-new-in-11g-r2-2/), here shows how to perform a manual cleanup in 11gR1, but also shows the new features and scripts in 11gR2. Log in as root user on the node you encountered the error. Change directory to $GRID_HOME/crs/install. Run rootcrs.pl with the -deconfig -force flags on the node you have the issue. If you are deconfiguring Oracle Clusterware on all the nodes in the cluster, then you have to add the -lastnode flag on the last one in order to deconfigure OCR and Voting disks. After these steps, run the root.sh script again. This time it will smoothly run.